Dirty Corner is on view in the Versailles garden until November first 2015. The site-specific monumental sculpture was created specially for the exhibition in Milan, titled “Dirty Corner”, realized by MADEINART in collaboration with Comune di Milano and Fabbrica del Vapore. The Milanese exhibition with two venues is still the most visited exhibition of the city. The installation consists of a huge steel volume 60 metros long and 8 metros hight, with the visitors can enter. A “tunnel” able to generate a series of reactions and sensations in the public. In Milan the artwork was progressively covered with around 160 cubic metros of soil, while in Versailles it was surrounded by huge rocks. Sure the sexual evocation of the sculpture, but manifold are the readings: from dark cavern of the soul where the man is swallowed and forced to walk in his/her own insecurity to pleasant and solid mother. 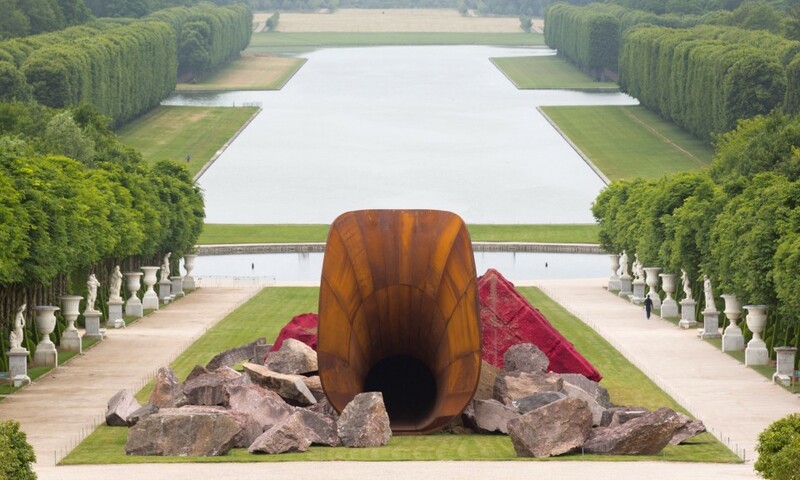 “For Anish Kapoor a work of art doesn’t exist alone but trough its viewer.” Says Caterine Pégard, President of the Palace of Versailles. “The visitors at Versailles will witness the dualities of artist’s work: heaven and earth, visible and invisible, inside and outside, shadow and light”. Dirty Corner is not the only artwork of the French exhibition (titled just “Kapoor Versailles”), it also includes a series of works with have the typical iconography of the artist – curves, mirrors, lights and shades – in order “to welcome the chaos” as Anish Kapoor said “in the formal proportion of the gardens, created by the architect André Le Notre”.